Jehovah Jireh, O God who Provides! The Lord is my shepherd, how can I ever want! You shall supply all my needs, according to Your bountiful and limitless riches in glory. El-Roi, the God Who Sees, You have given your angels charge over me. In my time of greatest need, I can always come to my Father’s place where there are many mansions. All I need do is ask of my father, Abba Father. I give thanks to you Oh God, for this blessed day. Today, my dreams will abundantly flourish. My plans will surely succeed. My destiny will be assured. And my heart’s desires will be granted. All this, in accordance with the will of you, Oh Father, in Jesus’ holy name. I will continue trusting in You with all my heart and soul. Psalm 23: 5 Thou preparest a table before me in the presence of mine enemies: thou anointest my head with oil; my cup runneth over. 3 John 1:2 Beloved, I wish above all things that you will prosper and be in health, even as thy soul prospers. As I awaken this morning, may my life be clean, calm and clear as the early morning dew. The finances I need will know my name and address. The right people and right opportunities present themselves to me today. Exalted and Majestic Creator, You have freely made Your Abounding Grace available to me, so that I shall have all sufficiency in everything from You. You are my source, my power, my healer, my deliverer, the Author and Finisher of my Faith. Though you, my ways are being made prosperous, and I shall Achieve Success in all my endeavours. Love the LORD your God with all your heart, all your soul, all your strength, and all your mind. Have a wonderful day in His name! Amen! Declaration: God richly supplies all my needs! For them to know Christ and for us that God will provide for our feeding program, giving food ,clothing to these unreachable people…. Yes lord ,I thank you all I need is meet today together in Jesus name Amen. AMEN? Thank you for the prayers I trust and love the Lord with all of me .God bless? I thank you for this new day,this blessed day,for being able to see,hear,touch,feel and walk this morning. I thank you for supply all my needs,and all the blessings in my life. My everyday daily needs will always be supplied.Amen. The good things are coming on my way. I will start my day with a grateful heart and be happy always. Thank you Lord for all your blessings. Amen. Amen, He is the beginning and the end. The lion of Judah. Thank you a lot for your prayers. We just need to have faith and trust in the Lord. I have learned that we are nothing without Him. We can do all things through Christ that strengthen us. Lets keep on pressing on until something happens. Lets pray for each other until heaven comes down. Never forget the worship him every day and to thank Him. I give You thanks my dear Heavenly Father,for this blessed day,for You ready instore for me and my needs will always be supplied.Amen. May Your goodness and mercy and Your love shall follow me all day long. I will continue trusting in You with all my heart dear God,for You always be with me in everything I do. Praying for you Emgardt and I want you to remember that you can live in God’s glory at all times. Let Him into your life, put Him first. Just ask Him to take over your life and He will do it. Just ask Him to forgive you and let Him start a fresh life in you from this day on. You are His. He made you and he loves you.You are never alone. Turn every situation over to Him. Bless you, my friend. Praying for you Katrina !! God is good and He is really and truly with you. I praise You and give thanks to You my dear Father in Heaven. I thank you for everything You have instore for me,and supply all my need,my Shepherd,my Savior. As I awaken this morning,may Goodness and Mercy shall follow me all day long. May today the good things are going on my way. 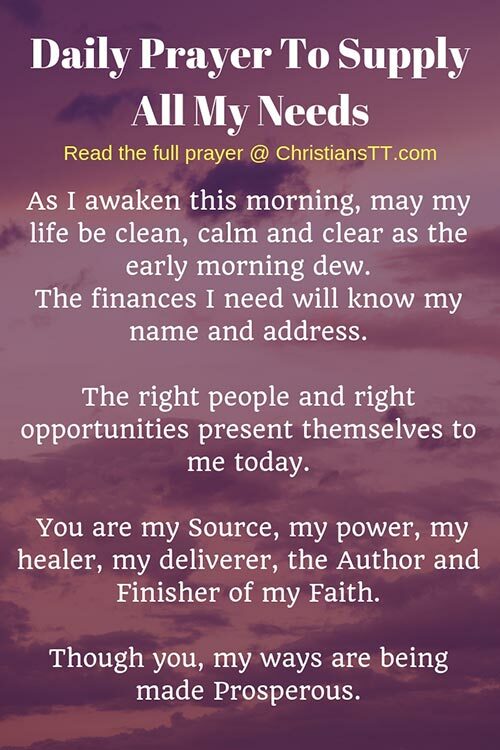 Thank you so much for this beautiful prayer,so that I can start my day with a grateful heart. MY JEHOVAH JIREH I THANK AND PRAISE YOU FOR ALL YOU DID AND CONTINUE TO DO FOR ME IN THE PAST THE PRESENT AND IN THE FUTURE YOU ARE THE MOST HIGH GOD. I THANK AND PRAISE YOU FOR SUPERNATURALLY BLESSING ME WITH GREAT FINANCIAL FORTUNE TO THE FULL TILL IT OVERFLOWS RUNNING OVER FOREVER THAT WITH YOUR HELP GOD AND ASSISTANCE FROM MY DIVINE PROVERB31 VIRTUOUS WIFE MY SOULMATE FOREVER WE WILL ADVANCE THE KINGDOM OF GOD BE A BLESSING TO EVERYONE YOU WANT US TO BLESS AND BE A SUPER BLESSING TO THE POOR THE WIDOWS THE ORPHANS AND THE AFFLICTED FOREVER.. IN THE MIGHTY NAME OF JESUS I PLEA THE BLOOD OF JESUS I HAVE GREAT FAITH IN BELIEVING BE UNTO US ACCORDING TO THY WORD SO LET IT BE WRITTEN SO LET IT BE DONE FOREVER AMEN…GRACE GRACE HALLELUJAH AMEN !!! We praise and give thanks to You Our Merciful Father,Majestic creator,who are in Heaven. Dear Lord God Jesus Christ,for You are Our Shepherd,Our Savior. I thank you for everything You have instore for me and supply all my needs. I pray that today,Goodness and Mercy shall follow me all day long. And the good things are going to my way. Thank you so much for this morning prayer,to star my day. Yes Lord I wish to be clean, calm and clear, giving my life to you.I praise you for your Mercy and Grace,I love you Lord so proud to be your lamb. I give thanks,to You my Lord God Jesus Christ,for today as I woke up this morning,I am so happy to see this wonderful beautiful blessed morning. I am so blessed today this morning.I have everything I needs to start my day. You have done for me in my daily life. I pray that today,surely goodness and mercy shall follow me all the days of my life. Thank you Lord,that good things are going to my way today.His mercy will follow me. Amen, I claim that the social security money that is still owed me will arrive asap, My frustrations and negativity will leave according to the GOOD LORD’S WORD AND GRACE, AMEN!!! Let me hunger for You in every way.